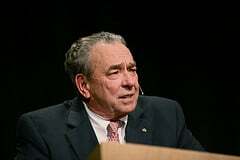 Dr. Sproul brought the conference to a close with a message entitled He Is Risen! — The Resurrection and Worship. The church marked the significance of the resurrection by changing the day of the week that God’s people had worshiped for centuries. The first day of the week was marked “The Lord’s Day” because that was the day that Jesus was resurrected from the dead. In Exodus 19 we find the announcement that the transcendent God was going to come down to meet them in His immanence. But there were preconditions. The people had to be consecrated so that they were ready when He came down. They needed to do everything in their power to be rid of defilement, to be clean when they come near to me. God didn’t want them coming near the mountain without appropriate regard for the significance of the meeting. You may say “clothes do not make the man.” That’s true. And a tuxedo won’t get you into heaven. That’s also true. But we distinguish between various kinds of clothes: formal, informal, sporting, etc. If you went to the White House to have a meal with the President of the United States, you would not wear shorts and flip-flops. We should not forget the historical context in which the Decalogue was giving. The people had to be consecrated. They were given the Decalogue in the midst of thunder and lightning. Dr. Sproul recounted preaching to 50-60 people at a church. He told them that he gets nervous before he speaks, every time. He told them, “Do you know who’s here?” God Himself. In Hebrews 12:22 we read, “But you have come to Mount Zion and to the city of the living God, the heavenly Jerusalem, and to innumerable angels in festal gathering.” We worship God in heaven itself. We get a taste of heaven itself in corporate worship. But you have come to Mount Zion and to the city of the living God, the heavenly Jerusalem, and to innumerable angels in festal gathering, and to the assembly of the firstborn who are enrolled in heaven, and to God, the judge of all, and to the spirits of the righteous made perfect, and to Jesus, the mediator of a new covenant, and to the sprinkled blood that speaks a better word than the blood of Abel (Heb. 12:22-24). Not only do we cross from the profane to the holy, from the secular to the sacred, we also join the communion of saints throughout the ages. Yet we attempt to make worship casual. Friends, worship cannot be casual. “For our God is a consuming fire.” Not God was a consuming fire, but God is a consuming fire. We’re to offer to God “acceptable worship, with reverence and awe.” But at many churches there is not much to be reverent about. But God has not changed one bit. He is still an all-consuming fire. He has given us the unspeakable privilege of entering His presence because He’s given us a Mediator who has paid for all our sins and clothed us in His righteousness. When you go to church, do you have an acute sense of being in the presence of God? If not, why not?